Characteristics of the multiple tropopauses in the tropics, by Sanjay Kumar Mehta, M. Venkat Ratnam, B.V. Krishna Murthy, J. Atm. Sol.-Terr. Phys., Pages 78-86 (link). Ionospheric characteristics associated with wave–particle interactions in a SED plume during a super geomagnetic storm, by Zhigang Yuan, Ying Xiong, Shunrong Zhang, Xiaohua Deng, Jingfang Wang, J. Atm. Sol.-Terr. Phys., Pages 96-101 (link). Summer time scintillations near the transition zone of the Indian longitude sector, by S. Chatterjee, S.K. Chakraborty, S. Majumdar, J. Atm. Sol.-Terr. Phys., Pages 102-115 (link). Intensity of climate variability derived from the satellite and MERRA reanalysis temperatures: AO, ENSO, and QBO, by Jung-Moon Yoo, Young-In Won, Myeong-Jae Jeong, Kyu-Myong Kim, Dong-Bin Shin, Yu-Ri Lee, Young-Jun Cho, J. Atm. Sol.-Terr. Phys., Pages 15-27 (link). The UK Institute of Engineering and Technology (IET) will host a Seminar on Solar Storms in London, 30th April 2013. Chair and Keynote Speaker, Prof Mike Hapgood, RAL says "Good engineering design must be the first line of defence against space weather." More information about the event is available on-line. The Space Physics Division at STFC RAL Space is looking to recruit an experienced space weather scientist/programme leader to join the team promoting the application of the Division's skills in the observation and modelling of space weather phenomena, in particular through the acquisition of emerging project opportunities. The successful candidate will demonstrate an ability to both ensure the effective space weather exploitation of current projects and to develop new approaches and applications related to space weather. He/she will play a key role in our team, applying her/his scientific expertise to create and lead new projects, acting as a scientific coordinator for our wider efforts to exploit future opportunities and working closely with senior staff in Space Physics Division to develop and implement an innovative programme, well-matched to future opportunities. The successful candidate will be required to maintain a strong scientific profile, both to ensure the quality and relevance of their work, and to ensure their reputation among potential partners. He/she will be expected to undertake personal research, in collaboration with other experts within RAL Space and among our international partners. This fixed-term appointment will be to STFC band E salary scale: £33780 - £43164 depending on experience. The closing date for applications is 10th May 2013. The 5th EISCAT_3D User Meeting will take place at the Ångström Laboratory in Uppsala, Sweden, 6th to 8th May, 2013. Please register as soon as possible. Traditionally hotel room availability in Uppsala at this time of the year has been tight, and thus we recommend you reserve a room as first priority. Effect of the solar wind conditions on the ionospheric equivalent current systems, by J. J. Zhang, C. Wang, B. B. Tang, and H. Li, ANGEO, 2013, Vol.31, pp. 489-501, SRef-ID: 1432-0576/angeo/2013-31-489, http://direct.sref.org/1432-0576/angeo/2013-31-489. The geo-effectiveness of interplanetary small-scale magnetic fluxropes, by X.-Y. Zhang, M.B. Moldwin, M. Cartwright, J. Atm. Sol.-Terr. Phys., Pages 1-14 (link). Retrieval of the three-dimensional wave structure of gravity waves from multi-position airglow measurements, by A.N. Belyaev, J. Atm. Sol.-Terr. Phys., Pages 41-50 (link). Channel electron multiplier operated on a sounding rocket without a cryogenic vacuum pump from 120 to 80 km altitude, by Shannon Dickson, Michael Gausa, Scott Robertson, Zoltan Sternovsky, J. Atm. Sol.-Terr. Phys., Pages 51-58 (link). A method for selecting the CIE standard general sky model with regard to calculating luminance distributions, by Vittorio Ferraro, Valerio Marinelli, Marilena Mele, J. Atm. Sol.-Terr. Phys., Pages 59-64 (link). Ionospheric bubbles detection algorithms: Analysis in low latitudes, by S. Magdaleno, M. Cueto, M. Herraiz, G. Rodríguez-Caderot, E. Sardón, I. Rodríguez, J. Atm. Sol.-Terr. Phys., Pages 65-77 (link). A position as postdoctoral research fellow in Plasma- and Space Physics is available at the Department of Physics, University of Oslo, Oslo, Norway. The University of Oslo is searching for a physicist with a numerical modelling background, to calculate scintillations in GNSS signals due to in-situ observed F-region plasma irregularities by sounding rockets. The announced position is associated with the group of plasma- and space physics and their STAR-initiative ("Space Technology And Research development centre") for a fixed period of 2 years. STAR is in charge of a sounding rocket program that takes advantage of the research infrastructure in Svalbard (optics, radars, GNSS scintillations) to study plasma waves, instability processes and turbulence in the F-region cusp/polar cap ionosphere. STAR also contributes to magnetospheric and planetary missions. The STAR group developed a novel Langmuir probe system for the Investigation of Cusp Irregularities (ICI) series of rockets, to measure absolute electron densities down to meter scales. The instrument is miniaturised and will also be used on several cubesat missions to be in orbit in 2014-2015 (CubeSTAR and QB50). The main goal of the current project is to verify that real time measurements of F-region plasma structure irregularities may lead to determinations of the resulting position uncertainties for the GNSS users on ground. The main part of the project will be to develop a software model to calculate the amplitude and phase fluctuations in the received radio signals on ground, based on the rocket observations of F-region irregularities. During the project period we will have two rocket flights to test the predictions from the model with GNSS ranging errors observed on ground. Applicants must have a Ph.D. in physics or equivalent experience in a relevant area (e.g. radio science, scientific use of GNSS receiver systems, classical theoretical background on wave propagation in an inhomogeneous medium, experience in phase screen techniques, or other relevant experience). The candidate must have demonstrated strong programming skills for advanced data analysis and visualisation techniques. A good command of English is required. More details on the project and application can be found at: http://uio.easycruit.com/vacancy/929700/64282?iso=no. Deadline for application is 19th April 2013. The EISCAT Scientific Association invites applications for observing time on the EISCAT facilities in 2013, by individual scientists, research groups, and consortia throughout the world on equal, competitive basis. This means that anyone can apply, independent of whether or not the applicant is from an EISCAT associate country. EISCAT is aiming to establish closer ties with the users of incoherent scatter radars (ISR) worldwide and bring in new users, young scientists, postdocs, and students who have not used the EISCAT facilities in the past. The EISCAT International Symposium, which will take place 12th to 16th August 2013, will also aim to reach similar goals of bringing ISR users from around the world to interact more closely and collaborate. The present call is the second call for 2013. In total, 200 hours of experiment time are open for international, peer-reviewed competition, and are available for the use of any of the current EISCAT facilities. Roughly half of this time has been allocated during the first call. The deadline for proposals is 1st May 2013 at 24:00 UTC. The relationship of thermospheric density anomaly with electron temperature, small-scale FAC, and ion up-flow in the cusp region, as observed by CHAMP and DMSP satellites, by G. N. Kervalishvili and H. Lühr, ANGEO, 2013, Vol.31, pp. 541-554, SRef-ID: 1432-0576/angeo/2013-31-541, http://direct.sref.org/1432-0576/angeo/2013-31-541. New plasmapause model derived from CHAMP field-aligned current signatures, by B. Heilig and H. Lühr, ANGEO, 2013, Vol.31, pp. 529-539, SRef-ID: 1432-0576/angeo/2013-31-529, http://direct.sref.org/1432-0576/angeo/2013-31-529. Significance of Wave-Particle Interaction Analyzer for direct measurements of nonlinear wave-particle interactions, by Y. Katoh, M. Kitahara, H. Kojima, Y. Omura, S. Kasahara, M. Hirahara, Y. Miyoshi, K. Seki, K. Asamura, T. Takashima, and T. Ono, ANGEO, 2013, Vol.31, pp. 503-512, SRef-ID: 1432-0576/angeo/2013-31-503, http://direct.sref.org/1432-0576/angeo/2013-31-503. Exospheric hydrogen density distributions for equinox and summer solstice observed with TWINS1/2 during solar minimum, by J. H. Zoennchen, U. Nass, and H. J. Fahr, ANGEO, 2013, Vol.31, pp. 513-527, SRef-ID: 1432-0576/angeo/2013-31-513, http://direct.sref.org/1432-0576/angeo/2013-31-513. Parametric validations of analytical lifetime estimates for radiation belt electron diffusion by whistler waves, by A. V. Artemyev, D. Mourenas, O. V. Agapitov, and V. V. Krasnoselskikh, ANGEO, 2013, Vol.31, pp. 599-624, SRef-ID: 1432-0576/angeo/2013-31-599, http://direct.sref.org/1432-0576/angeo/2013-31-599. 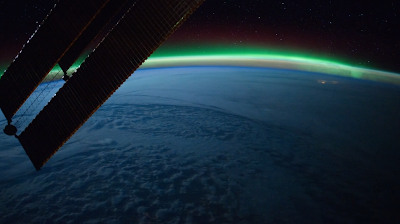 As today's Friday image feature, we found a compilation of some breathtaking footage taken from the International Space Station (ISS). Make sure to watch our beautiful planet in HD. Thermospheric neutral temperatures derived from charge-exchange produced N2+ Meinel (1,0) rotational distributions, by C. K. Mutiso, M. D. Zettergren, J. M. Hughes, and G. G. Sivjee, ANGEO, 2013, Vol.31, pp. 463-471, SRef-ID: 1432-0576/angeo/2013-31-463, http://direct.sref.org/1432-0576/angeo/2013-31-463. The Geminid meteor shower during the ECOMA sounding rocket campaign: specular and head echo radar observations, by G. Stober, C. Schult, C. Baumann, R. Latteck, and M. Rapp, ANGEO, 2013, Vol.31, pp. 473-487, SRef-ID: 1432-0576/angeo/2013-31-473, http://direct.sref.org/1432-0576/angeo/2013-31-473.